In the words of Etta James – At Last! At last there is an author willing to write a book that is not only relevant, but dares to challenge the mantra of ‘keeping it real’ within a genre in desperate need of a diversity transfusion. Tory Uncharted Terror Tory Tyson has inherited his father's love for music. Using what is in his hand, he wins a coveted radio contest. His belief that he has made it is challenged by a chain of events that will reshape what he believes to be his pre-planned future. Whether endowed with street wisdom or somewhat shielded by suburban life, neither demographic will find it hard to follow the storyline, language or examples set forth in this impressive novel. Both demographics will be able to identify with the fact that following the rules will not always insulate you from the predatory practices of others. 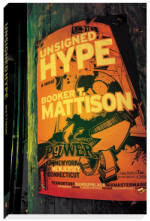 Unsigned Hype by Booker T. Mattison is not the quintessential story of a teen’s love for the Hip Hop culture. What it is is a well-written and entertaining ministry that opens eyes to the necessity of moving through life with faith and a lifestyle rooted in true integrity. Unsigned Hype is available wherever fine books are sold. Your style is unique compared to other people I've read stuff from. Thanks for posting when you've got the opportunity, Guess I will just book mark this web site. What's up everyone, it's my first visit at this web site, and piece of writing is in fact fruitful in favor of me, keep up posting these articles. IS LIFE WORTH THE RISK?